It took quite an effort after cancellations due to Hurricane Sandy, widespread power outages, and a nor’easter but Babywears of NNJ was finally able to assemble a meeting to offer tips and tricks for cold weather babywearing. Many of you, due to the aforementioned destruction, were not able to make the meetings so this is a review of what we learned to help you get through this winter. If the recent weather patterns are any prediction of future conditions, you may really need this! Specially made babywearing outerwear for mommy. These are coats made with babywearing in mind. There are many different styles and types to chose from including ponchos, coats with zip off compartments, jackets that allow for front and/or back carries, pull over vests and more. (image to right is mommy and baby in a Peekaroo vest). You could also choose to make one of these coats yourself. Coats you already have. These are things from your closet such as a maternity coat or a man’s oversize coat (image left) that can wrap around baby and mommy. 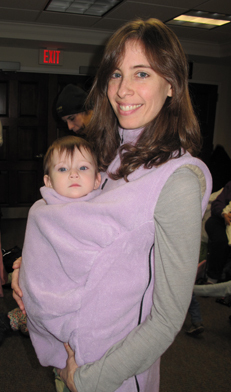 Scarves can be used to keep mommy warm and can also be used in a babywearing pinch so they are good to have around. click here to learn emergency babywearing tricks. Child sized leg warmers called babylegs. click here to learn how to make your own babylegs. Hats that cover the neck. 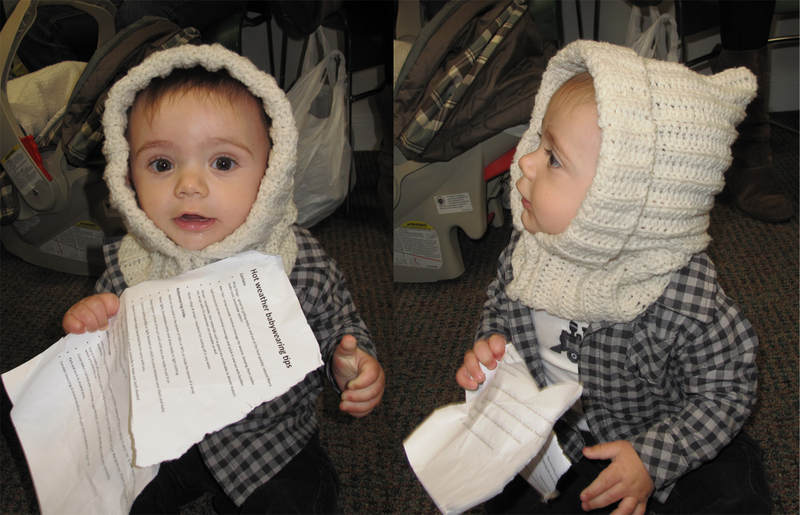 (See pictures below) click here to learn how to make your own crochet hat as seen below. Do not overdress. 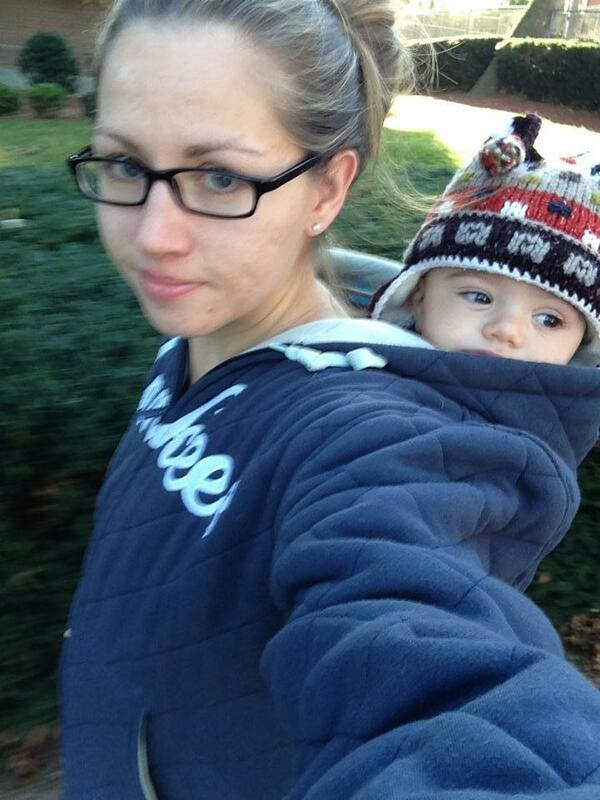 This is probably the most frequent problem with cold weather babywearing. Parents bundle up baby, wrap them up in a carrier, and then bundle them both up in another outer layer. All those layers can easily be too much. Remember that each item covering your baby is another layer including the wrap itself. Be aware of baby’s ability to breathe. All those added layers can shift around and sometimes cause material to cover baby’s face. Remember to check your child often. Wear proper footwear. Sneakers or snow boots would probably be best to avoid falls. If it is particularly icy there are even shoe attachments you can get that act like cleats on the ice. The last thing you want is to slip and fall while carrying your baby. If possible get dressed in your car or at your location to avoid to much time standing in the cold.